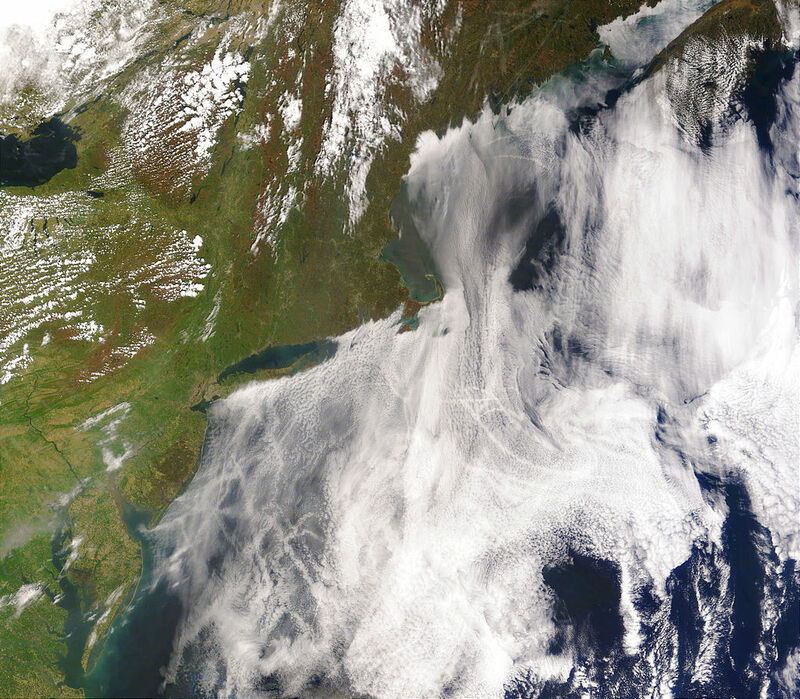 Satellite image of clouds created by the exhaust of ship smokestacks (2005). Credit: NASA. License: PD. Medimorec & Pennycook (2015) analyzed the language used in two prominent reports regarding climate change. Climate change is not a subject of scientific debate anymore, but of political discourse. Nevertheless, it appears that there are a few scientists that are skeptical about the climate change. As part of a conservative think tank, they formed the “Nongovernmental International Panel on Climate Change (NIPCC) as an alternative to the Intergovernmental Panel on Climate Change (IPCC). In 2013, the NIPCC authored Climate Change Reconsidered II: Physical Science (hereafter referred to as ‘NIPCC’; Idso et al. 2013), a scientific report that is a direct response to IPCC’s Working Group 1: The Physical Science Basis (hereafter referred to as ‘IPCC’; Stocker et al. 2013), also published in 2013″ (Medimorec & Pennycook, 2015) . “it is very unlikely that non-experts (present authors included) would have the requisite knowledge to be able to distinguish the NIPCC and IPCC reports based on the validity of their scientific arguments“. So, they proceed on counting nouns, verbs, adverbs, and the like. The results: IPCC used more formal language, more nouns, more abstract words, more infrequent words, more complex syntax, and a lot more tentative language (‘possible’, ‘probable’, ‘might’) than the NIPCC. Which is ironic, since the climate scientists proponents are the ones accused of alarmism and trumpeting catastrophes. On the contrary, their language was much more refrained, perhaps out of fear of controversy, or just as likely, because they are scientists and very afraid to put their reputations at stake by risking type 1 errors. “the IPCC authors used more conservative (i.e., more cautious, less explicit) language to present their claims compared to the authors of the NIPCC report […]. The language style used by climate change skeptics suggests that the arguments put forth by these groups warrant skepticism in that they are relatively less focused upon the propagation of evidence and more intent on discrediting the opposing perspective”. Posted on November 4, 2015 August 7, 2016 by NeuronicusPosted in 2015, Atmospheric sciences, Humans, PsychologyTagged 2015, climate change, IPCC, NIPCC, politics, text analysis. Next Next post: Is religion turning perfectly normal children into selfish, punitive misanthropes? Seems like it.